Are you wondering if you will succeed in nursing school? Do you find yourself doubting whether you’re cut out for it? If so, this free test that can help you determine whether or not you can succeed in nursing school. After you complete the “Will I Succeed In Nursing School” Quiz, hit the submit button. It will refresh this same page for the results. Will you succeed in nursing school? Take this fun quiz now to find out. I am eligible for financial aid or scholarships, my parents will help me, or I can find other ways to pay for school. I'm ineligible for financial aid, I'm in debt to my eyeballs, and I have no idea how I'll pay for school. Yes, I've been convicted of a felony before. No, I've never been convicted of a felony. Nope, I'm going to focus 100% on my studies. I may work during the summers or fall break. Unfortunately, I have to work year-round to pay the bills. I'd feel discouraged and think, “maybe this nursing stuff isn’t for me”. I may switch my major. Seek out a tutor, buy some flashcards or a study guide, and buckle down and study harder. I'm not giving up withotu a fight! I never miss class unless an emergency happens or I'm sick. I tend to skip classes that I find boring. I'd probably send text messages, daydream, and think about my weekend plans. I'd look over my notes, try to write down what the professor says, and make good use of my time. You think to yourself, “oh, how gross!” You then go and find the patient’s nurse or nursing assistant. You are concerned about the patient and what caused the vomiting, and you immediately help the patient by getting them cleaned. Then you find the patient’s nurse. Wait to the last minute and have a cram-a-thon while pulling an all-nighter. Start reviewing your notes and PowerPoints a week before the exam to help refresh your memory of everything you have already been studying since the beginning. Forget tests, this person is gorgeous! You'd tell them that you'd love to go out, but you've got a huge test. Then you'd reschedule the date. Buy a study guide for the exam and attend a study course that is being held on campus. Wing it. You figure, “I’ve passed up to this point so the exam shouldn’t be that hard”. So you prepare by scanning your notes. I'll do it! You are excited to finally be doing some “real” nursing skills. Drop out of the program. Obviously I'm not cut out for this. Realize that many great nurses also failed a class or two, and do what it takes to pass next time around. If you’re thinking of going to nursing school, or if you’re currently enrolled, get the new guide to help you succeed. “How to Pass Nursing School” has information students can use to help them prepare for the journey ahead. Learn about everything you can expect in nursing school, the different programs available, how to study and prepare for tests, and more. You’ll also get tips on passing NCLEX and getting a job after graduation. As a FREE BONUS, you’ll get a special download link and password in the book, which gives you access to premium resume templates and cover letters (in .docx format) that you can use after graduation to secure a job. What are you waiting for? It’s a no brainer. Click here to learn more and grab your copy today of How to Pass Nursing School. 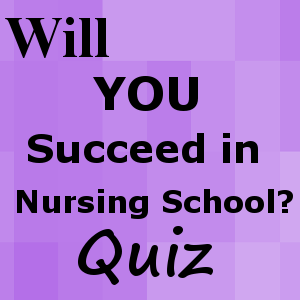 Thank you for taking this free “Will I Succeed in Nursing School” Quiz/Test.